with all your heart to give yourself to it. We are revisiting the initial set of the Bhavana Project from 2005. 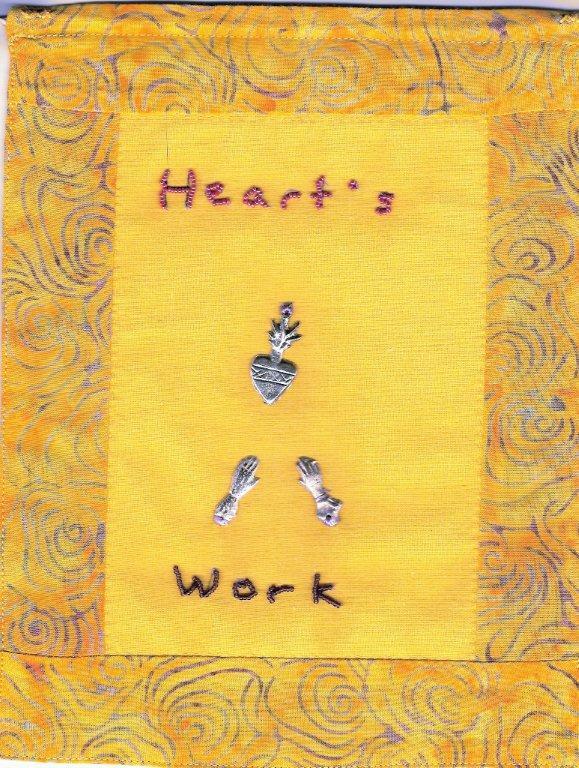 Marjorie Beale inscribed the third flag with "Heart's Work" using beads, milagros and stitching. 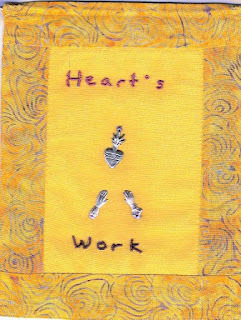 Later, Marjorie reported that she found her heart's work after participating. A bit of history if you are just joining us. 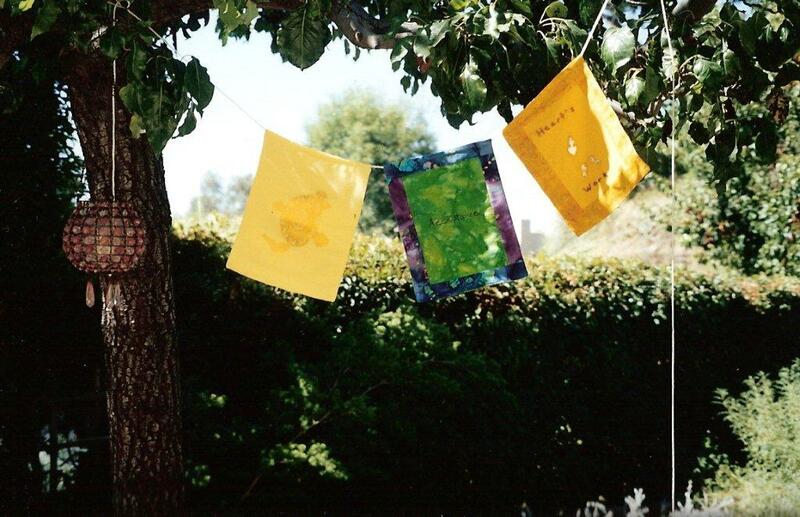 This set of twelve prayer flags began in July 2005. Each participant chose a personal theme for their flag. 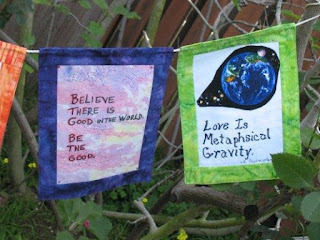 It is the first set created for the Bhavana Project, which is an ongoing community art work intending to share wishes and aspirations with the wider world. New participants are always welcome! 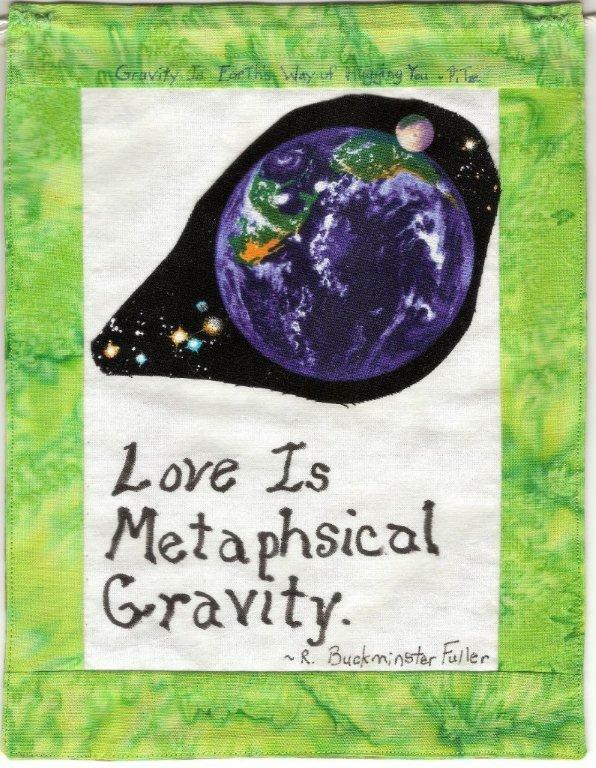 Gravity is Earth's way of hugging you. Taking a break from revisiting older Bhavana Project flags to show you something new. The flags have returned from my friend Kate Matousek, with her addition to the current set. And a wonderful contribution that 6th flag is! 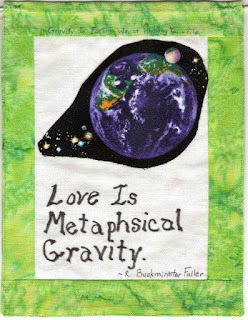 Kate centered her ideas around affirmations of science and the planet. As a retired elementary school teacher, Kate is no stranger to creativity. Over the years, she has participated in making special flag set that were gifted to other friends. She also was part of a group collaboration creating a flag for the third Bhavana Project set in 2010. Kate shared her enjoyment, saying it "deepens my understanding of the creative process and the profound AH Has that are to be experienced." Thank you, Kate! I love hearing that, for the process is indeed about discovery. I am adding the 7th flag to the set, preparing to send them on to our next player. There will be 5 more flags to follow after that (12 flags make up one set). We would love to have you join in! Returning to the start of the Bhavana Project, we begin a weekly revisiting of the prayer flags from that initial set. Tibetan prayer flags have long been inscribed with prayers or invocations for the wind to carry beneficial vibrations across the land. 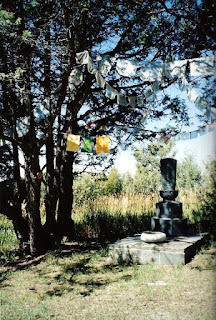 Inspired by this tradition, in 2005 I created The Bhavana Project, an ongoing group work to acknowledge the goodness in our lives. These flags are intended to cross cultural boundaries. 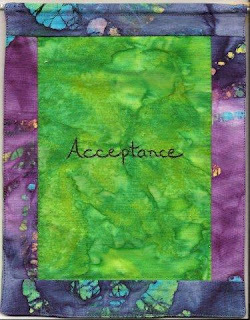 The first flag I chose to leave blank, other than the pattern on the cloth itself, as a symbol of openness to what will come. 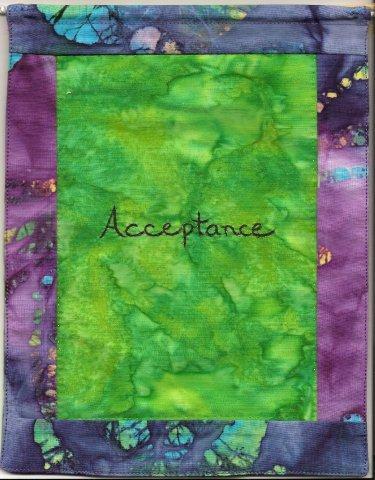 The second flag I embellished the word "Acceptance", ready to drop resistance and receive. As a note: With later sets, I always create the first flag to get the set going. 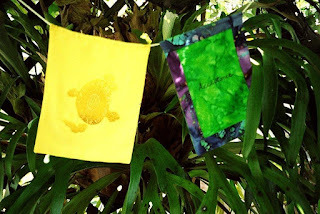 I then invited friends to embellish a flag, and then photograph it. Each participant chose a personal theme. What a joyful process it became for all of us involved. Stay tuned as we watch the development of this set of flags.